The wonderful Sandy Hibbard, of Lyric Marketing & Design, hired me again this past week to take photos for a client of hers, Stephanie McAndrew. Stephanie is a writer/activist who promotes the empowerment of women & children in the states & abroad. When Sandy first approached me, she mentioned that along with the some of the more traditional headshot images, she also wanted something out of the box for Stephanie’s portrait. I racked my brain for a ideas and came up with a couple decent ones but never had “it” figured out. About a week later, I went to The Film Depot in Richardson to pick up some film sleeves for the 120 & FP-100C I’d been shooting. Now, I’ve been to this place a kajillion times and I always browse through almost everything when I’m there. For some reason or another, I had never seen the brand-new-in-box Polaroid Emulsion/Image Transfer Kit that was sitting waaaay up high on the shelf. I asked the owner if I could pull it down to look at it .. she nodded her head. I grabbed the box and white flakes came floating down all over me. I took a deep breath, blew the top of the box and a cloud of dust flew through the store. The owner laughed, smiled and told me that she’d be willing to make a deal with me. The box said $25 but she’d take $15. I opened it up, saw that the deal was good and paid the kind lady. Score! The week of the Stephanie’s shoot came up and I had been toying around with emulsion lifts/transfers. It didn’t quite dawn on me until a day or so before the shoot, but I knew that a collage of emulsion transfers would be a really cool fit for Stephanie’s portrait (out of the box? √ ). We discussed possible locations the day before and decided on using The Heard Wildlife Sanctuary in McKinney. The shoot was a blast! Stephanie & Sandy were in great spirits the whole time as I took them on a wild goose chase of a photoshoot. I had been to the Heard before with Synthia and remembered where some of the nicer ‘available light’ locations were. The only issue was we had to walk about 2-3 miles total to get to all of them (sorry again ladies ..). About 1/2 way through the shoot, we came to the spot I had planned on using for the collage of emulsion transfers. I had Stephanie sit on a bench and started snapping away with a Polaroid 100 Land Camera. I took 6 images in the style of David Hockney and tucked them away in my homemade box to dry. A day later, once the prints had fully dried, I pulled the materials out of the Polaroid Emulsion/Image Transfer Kit and gathered anything else I needed .. Along with the kit I purchased, I received a step-by-step guide to emulsion transfers. If you’d like to view a PDF of it CLICK HERE. The process was pretty simple ..
Cut my contact paper so it was about the same size as the print …. Once all of the images were trimmed and set up with contact paper, I started heating up some water on the stove. When the water was 160 degrees I poured it into the one of the trays and filled the other tray of water with tap water. Pushed the edges of the emulsion towards the center with my thumbs and it eventually slid off …. Pressed it against the watercolor paper .. When the piece dried, the watercolor paper wrinkled a bit and little portions of the transferred emulsions were rising up from the paper. I placed the piece in an 8×10 frame to flatten it but was bothered by the negative space that was surrounding the transferred images. I’m a stickler. I went back to the Heard a few days later and took 9 more photos at approximately the same time of day as the first shoot. The images dried and I transferred them to finish out the piece. NOTE: If you’re experienced in transfers and have any suggestions/comments to share, I would love to hear from you! Also, if you like this technique and would like to have a unique image created for you , email or call me! I’d be happy to create something original for you! Hiya with regards to the Image Transfer process, what is the purpose of the contact paper? on. You’ve done an impressive activity and our entire group will be grateful to you. I just starting doing these, but in my limited experience, the back does not dissolve. 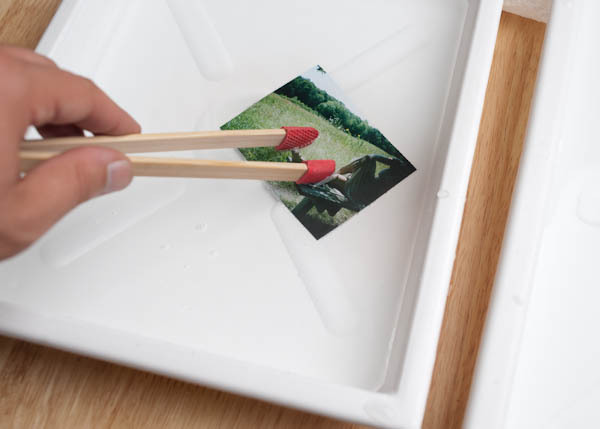 I’ve found that, while you still need to be careful handling the emulsion, it’s really not as delicate as the actual Polaroid ones apparently were (from what I read – I never did one with real Polaroid film). I don’t know what temperature water I use – it’s just very hot. I also don’t transfer it into the cold water – it lifts just fine in the hot and the edges might even curl a bit less at the edges (I haven’t tested that empirically yet!). I tend to pick up an edge very gently with a pair of tweezers, and it peels right off the back. Then I just use my hands for the rest of the process. I’ll be putting up a post of my own on this tomorrow (http://moderndinosaur.wordpress.com). 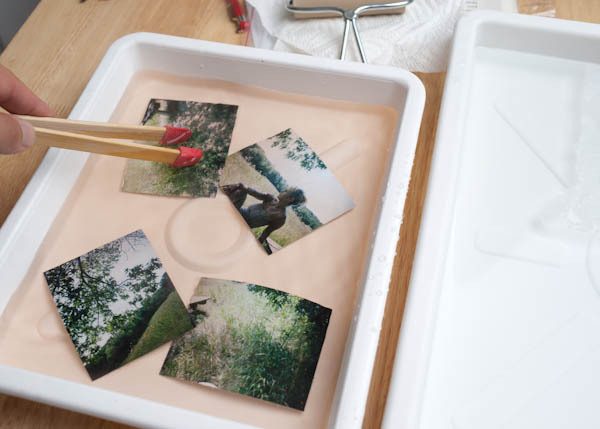 You are currently reading Fuji FP-100C Emulsion/Image Transfer at Justin Goode.